The best gift to give is one from the heart. Diane's (48 year old) daughter, Candy, had just recently received a much awaited and anticipated heart transplant. Congrats Candy!! To celebrate this milestone in both their lives', Diane went on a search for a meaningful gift. She came across Charlene's Custom Live Life Give Life Red Heart Transplant Bracelet (B113-HRT). Immediately she knew this was the perfect gift for her daughter. The original handcrafted beaded bracelet design was modified slightly but still retained all the important elements of our exclusive design. 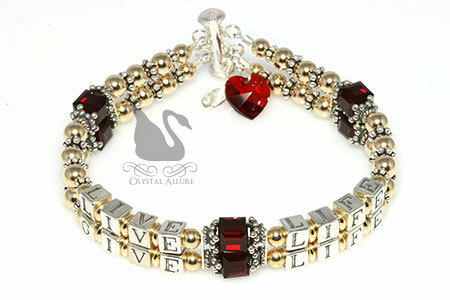 Diane's custom awareness bracelet features a mix of both sterling silver and 14 karat goldfill precious metals, red Swarovski Crystals, sterling silver letter block beads that read 'Live Life Give Life' and finished with a red Swarovski Crystal Heart charm and our signature jewelry tag. A symbol of HOPE. A source of AWARENESS. This bracelet represents the voices of individuals and their families who face life-threatening illnesses everyday. Anyone, worldwide, who has been touched by a life-threatening illness knows the importance of the gift of life -transplant. Organ transplant is made possible by the those individuals who have lived their lives and choose to give life back through organ donation. Consider donating your organs today. As I prepared this blog post I realized how much admiration I have for my customers. Each customer who contacts me for a custom awareness bracelet is either at discovery, nearing, in the middle of, or past their personal crisis. And their lives are forever changed by it. In their search for hope, understanding, healing, remembrance, they open their hearts and share with me their personal stories. There are many exchanges that I simply do not share here because, I feel, they are something which was between just them and myself. Many of us protect ourselves from hurt by putting up those walls or closing up our hearts. But, doing this also closes out someone who could really touch your soul. The point is, with great love comes the possibility of being hurt -that's the risk you must take. I'll be the first to admit, it's not easy being vulnerable, or opening up. But, these very special people open their hearts to me and I, in turn, warmly reciprocate. I have no hidden agenda in getting to know my customers and what brought them to Crystal Allure Jewelry. And I feel each one has the potential to add great value to my life and happiness. They trust me with their personal stories and lives to create for them something that will be treasured for a lifetime. It is really, I, who gets the greatest gift. 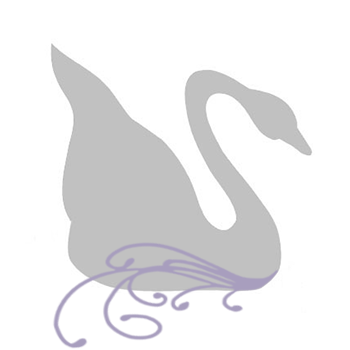 Which is why I put so much of myself into each design and incorporate as many personal touches, as possible. There is a special meaning to every awareness design I have created and with it comes stories of heartbreak, strength, courage and hope. Even today, I share the occasional email with some of my past customers'. It's a great feeling and I really must thank my fantastic customers for allowing me into their lives and for trusting me with their heart.